mountains – The mountains of the Sichuan and Yunnan provinces provided some of the most beautiful and dramatic scenery of our trip. 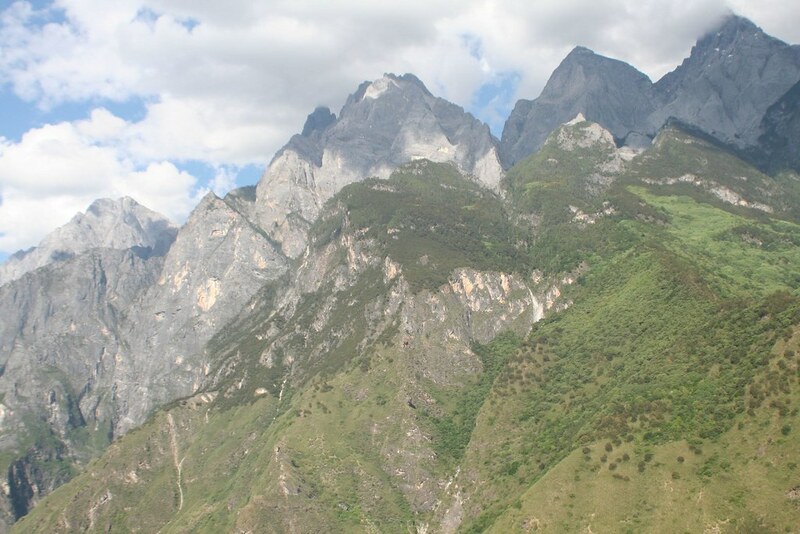 Hiking Tiger Leaping Gorge was a definite highlight for us. point and fry – Finding veg food in China has been a source of endless frustration. It certainly exists and when we do find it, it's been pretty tasty. By far some of the best and cheapest food has been at bus stops on our long distance journeys. There are usually a number of stalls with numerous bowls of fresh ingredients. You just walk up and point to the ingredients you like and they fry it up for you. Fast, fresh and cheap! air conditioning – Sitting there in your overly cooled office, you are probably taking for granted that you are chilled to the bone right now. Well, after two months of very little AC in India, we were most pleased to find out the AC is the norm on most buses, trains and in hostel rooms. Ah…refreshing. Sun Jie Hai commercial – Sun Jie Hai is Chinese and plays professional soccer in England. With great regularity, CCTV 9 (the English language propaganda channel) plays a commercial for London based Jade Travel featuring Sun Jie Jai and another guy we suspect if just a regular old footy fan. It's not entirely clear to me why we laugh every single time the commercial is on and continue to quote it randomly throughout the day, but I think it may have to do with the way the footy fan asks Jie Hai, "Oh, why" as if he were Garth from Wayne's World. He even kind of distorts his mouth like him and looks uncomfortable. Sadly there's no Jie Hai commercial on YouTube and we didn't manage to video it ourselves. I haven't done it justice, but I tell you it's hilarious. peoples' parks – A highlight of China's cities is it's parks. They are pleasant places to stroll around and observe an older generation of Chinese men and women performing impromptu concerts, playing traditional musical instruments, practicing tai chi or flying elaborate kites. This is the China you probably won't see in 20 years. Chinese kids – We're not sure what it is, but they are incredibly cute – especially the boys. Maybe it's the buzz cut or maybe it's all the doting they get as the only child in the family. Who knows, but they sure made more than one bus ride entertaining. bicycles – This is THE bike nation. There are special lanes for cyclists, monitored bike parking lots and portable bike repair shops all around town. Though it seems the personal auto is one the rise, hopefully the tradition of pedaling to and fro won't go away.